European Commission President Jean-Claude Juncker's idea to create a common European military force has triggered deep concerns among Eastern European leaders. 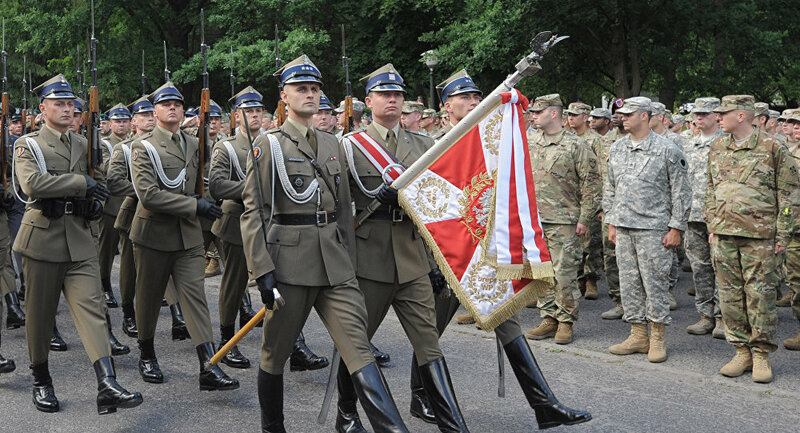 "Eastern European countries, led by Lithuania, Latvia and Estonia and with the private support of Poland, will criticize the plan as an 'EU army' that will undermine NATO," Bruno Waterfield of The Times reported Thursday. Waterfield quoted Edgars Rinkevics, the Latvian foreign minister, who claimed: "We take a very skeptical view on the idea or creation of an EU army. I really do not see any value for the European army." The journalist emphasized that Eastern European states fear that the EU military plan may provide major Western European countries, such as Germany or France, with an excuse to "neglect their new obligation to NATO." Waterfield called attention to the fact that three months ago the Alliance's leaders agreed to deploy four battalions comprising 4,000 American, British, German, French and Canadian troops in the Baltic states and Poland. Germany and France have praised the idea of creating an armed EU force. "The way to a European army is far away. But the way ahead is something that is important. Our populations are expecting closer cooperation in the field of security, including defense," German Foreign Minister Frank-Walter Steinmeier said Tuesday as quoted by the journalist. For her part, German Defense Minister Ursula von der Leyen called upon the Lithuanian leadership "to move forward to a European defense union, which is basically a Schengen of defense," during her visit to Vilnius, Deutsche Welle noted on September 8. Why Does Europe Need Another Military Alliance? Meanwhile, on September 11 Le Figaro reported that French Defense Minister Jean-Yves Le Drian and his German counterpart Leyen sent a letter to EU leader Federica Mogherini urging her "to take measures in the field of defense of European citizens" and called for a new unified command center and a single EU military budget. The Franco-German letter highlighted that given the UK's decision to leave the EU the bloc would henceforth act as a 27-member entity. Britain has repeatedly protested against the creation of an EU army, insisting that the new armed force would duplicate NATO. A few days later, on September 15, French President Francois Hollande and German Chancellor Merkel announced the plan to create "a permanent EU military headquarters" during their bilateral meeting in Paris, ahead of the EU Bratislava summit. Predictably, Lithuania's President Dalia Grybauskaite reiterated Friday that "European armed forces are out of the question." "We cannot afford to overlap NATO," Grybauskaite told journalists at the EU summit in Bratislava, as quoted by The Baltic Times. In an interview with Russian online newspaper Vzglyad, Kirill Koktysh, an associate professor of Political Science at Moscow State University of International Relations (MGIMO), reminded the media outlet that Brussels' concept of a unified European armed force is not new. Koktysh recalled that the Western European Union (1948 — 2011), an international organization and military alliance, was largely regarded as an alternative to NATO. "Europe has got used to taking care of its security, the concept [of an EU army] is not new," he told Vzglyad. According to Koktysh, the problem is how soon Europe will become independent from the US. He stressed that NATO's membership cost "too much" and since a country has to pay at least 2 percent of its GDP, many European states are seeking a less expensive option. Russian historian and expert on Polish affairs Vadim Volobuev pointed out that Eastern European states are focused on maintaining close cooperation with NATO and the US. He told the media outlet that Warsaw's dissatisfaction with the idea of a new European military force is understandable. Currently, Poland is playing the role of a NATO foothold on Russia's doorstep. Within an EU army, however, Warsaw's role would be significantly diminished: the EU leadership is far more concerned about the real threat posed by Islamists and terrorists flowing into Europe from the Middle East and North Africa, than a mythical threat from Moscow.